In this article built-in component editors and edit actions for them are discussed. To learn about Webix editing pattern, go to the main article. an editor is closed by moving focus outside the editor (e.g. clicking another component part) or by pressing the 'Enter' hot key for saving the new value, or the 'Esc' hot key for exiting without saving. 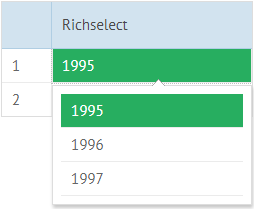 A base editor for text values of DataTable and DataView cells, list rows. By default it is enabled on clicking the needed item. You can define a numeric format for entering values into a text editor. For this purpose, you should use the numberFormat attribute. You can apply number format for a text editor depending on the set locale. A base editor for passwords that masks symbols in the input. // in the property sheet an editor is defined by the "type"
A customizable text editor. Here you should set a template for the editing area - the type and dimensions of an input area. If you specify the editor:"inline-text" attribute, the component will provide a special processing treat for the editor while editing: invoking edit-related events. If you don't specify the editor attribute, you should provide the processing logic for the editor on your own. A customizable editor that allows choosing one of the offered values. It looks like a standard HTML select control. The options can be defined by either a simple or an associative array as well as by an url. Look here for details. Webix Combo control with the possibility to filter a popup list by entering symbols into the dedicated input. The editor is a subject to extensive customization. Webix RichSelect control that is a non-editable variation of a Combo editor. The editor is subject to extensive customization. The editor is based on Webix MultiSelect control and allows selecting multiple options at a time. 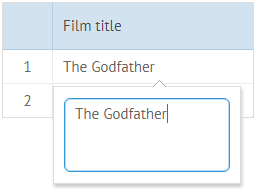 The optionlist property is defined for the editable element (here:column) so that it could parse multiple values from the editor into a single cell value. The options can be defined by either a simple or an associative array as well as by url. Look here for details. A checkbox editor presupposes the choice between two values (true or false). In general, yon can assign any value to "true" and "false" checkbox states. A customizable checkbox. You can do without a checkbox icon and define any template for boolean values, even a styled text. 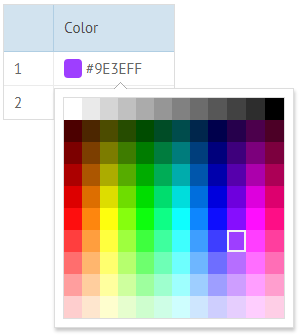 It is used for editing color value in the dataset with the help of a Colorboard. Colors are stored as hex codes; hence, you should set an appropriate template for a component item to display the chosen result as a color, for instance, to make a colored background. 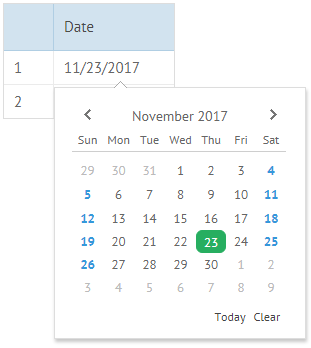 In its essence, it is a DatePicker that initializes a Calendar to pick the necessary date. textarea - a multi-row input for editing long texts. The popup features width: 250 and height:50 by default. colorboard and calendar - come in popup windows by default and are set as date and color editor types. Besides the standard for editors "Enter" hot key used for entering text, the Popup editor supports the "Shift+Enter" hot keys functionality. It is used for making a new paragraph in a multiline text (moving a part of text to a new line). Select editors offer a wide range of customization possibilities that are described in detail separately. 2) Options are defined by a separate variable containing an options collection. In this case the "options" attribute must be set to the name of this variable. 3) Options are taken from a file or loaded by an url defined by a string value of the "options" attribute. 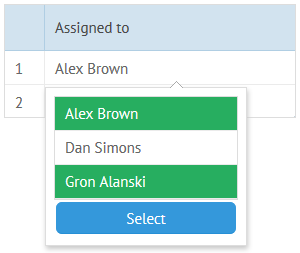 "Options" have an alias attribute "collection" that features the same functionality. functions can be attached to a list. 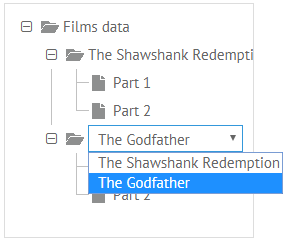 Webix datatable, treetable and property sheet can use any of the above mentioned editors in the live mode and update the same data property in case it's used not only in the edited column. 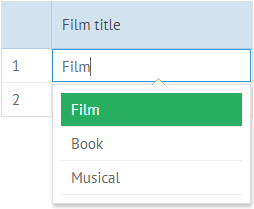 The moment the second column (the one that is automatically edited) changes its value, onLiveEdit event takes place. 'custom' - allows setting the necessary way of editing, e.g a keyboard event. Here editing is enabled on pressing the "Enter" key on the selected item. The library allows creating fully custom editors. getInputNode() - gets the input area object. this.popup - the popup ID (is used for editors with popup windows). In addition to creating an editor "from scratch", you can extend any of the existing ones. It becomes helpful when slight changes are needed. 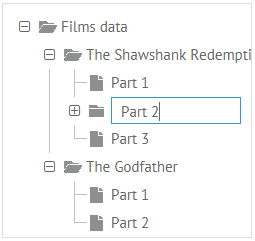 For instance, you have a datatable column with e-mails. The input type email from HTML5 package will warn you in case some of e-mail address features are missing.